Hovering overhead in the Olympic Sculpture Park’s PACCAR Pavilion is the work of Seattle native, artist Victoria Haven. 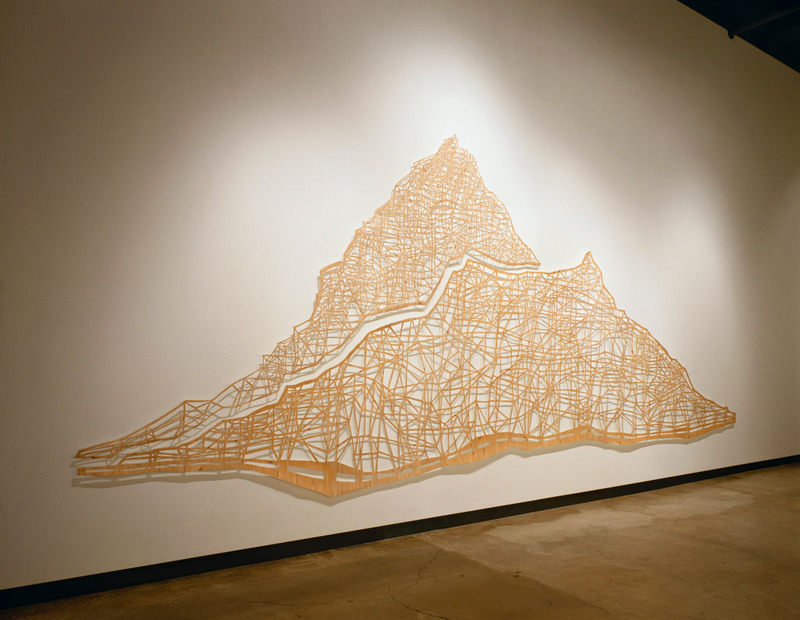 Blue Sun is a wall drawing inspired by a 2015 video project where the artist filmed the large-scale demolition and development of South Lake Union over a ten-month period. One of the more dramatic examples of Seattle’s rapidly changing urban core, Haven captured over 500,000 still frames through her art studio window and created a time-lapse video piece. Editing and viewing this footage piqued Haven’s interest in the movement of light and shadow and how light impacts a space differently depending on the objects, or in this case architecture, it encounters. 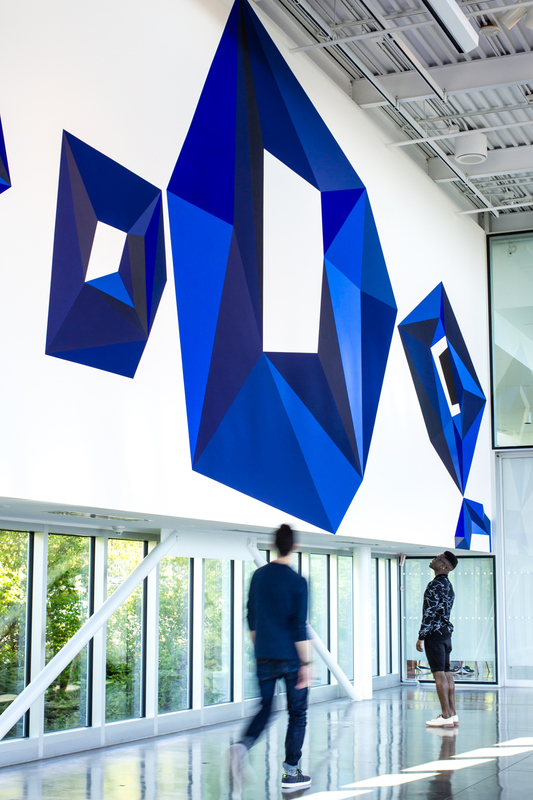 With the Olympic Sculpture Park as a canvas for light and shadow, Haven approached the PACCAR Pavilion with a curiosity and intent that she shares with us in this interview about the bold crystalline forms that traverse the entire length of the east wall. 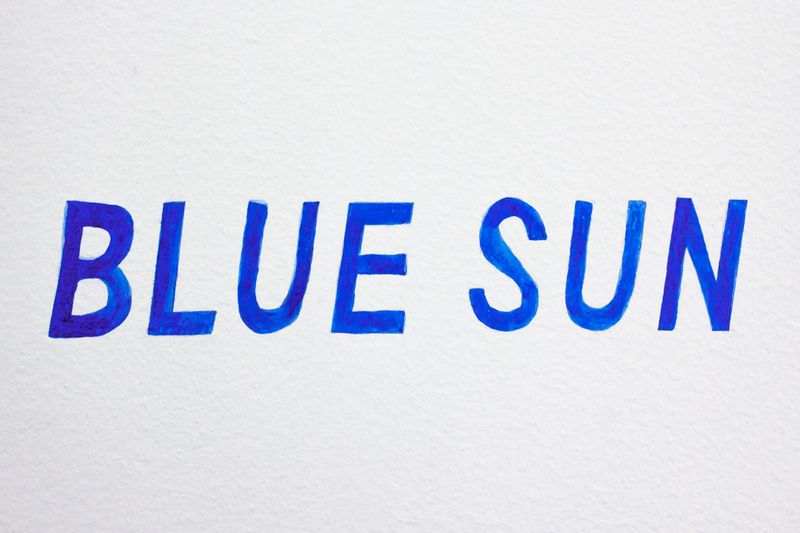 Blue Sun closes March 5—don’t miss it! SAM: How do you see Blue Sun functioning as a sculptural painting in dialogue with the sculptures around it? Victoria Haven: The first thing I did upon being offered the opportunity to create a work for the Pavilion wall, was to spend many hours in the space considering both the interior architecture (windows, walls, floor, chairs) and the exterior forms in the Sculpture Park; the most visible being Serra’s Wake to the North and Calder’s Eagle to the West. These colossal structures are incrementally transformed throughout the day as dramatic shadows appear and recede, based on the intensity and variety of natural light. I tried to capture this dynamic sensibility in the bold shapes and implied motion of my wall painting. Also at play are the Olympic Mountains in the distance, which I consider an extended border of the park, as they are visible from nearly every vantage point—including the Pavilion where my work is sited. The composition and forms of Blue Sun are in conversation with these works and others (i.e. Tony Smith’s Wandering Rocks), in terms of scale and geometry, as well as being a direct response to the monumentality of the peaks to the West. There is movement to this piece. Do you ascribe a narrative to the work? If so, is this narrative motion cyclical, linear, other? There is an implied motion/movement in this work in that it is a sequence of forms presented horizontally, and (for most Western trained eyes) from left to right. These forms create an arc that points to the cyclical nature of the sun’s transit across the sky, referring to both daily and cosmological durations. In this sense, it operates as a narrative—or perhaps a framework or container for a narrative—by addressing two vastly different time-scales via repetition. The geometric forms of Blue Sun appear in a lot of your work. Why are these forms useful or important to this piece? I consider all of my work, whether in two dimensions or in three, to operate within the discipline of drawing. Line is the essential component of my practice, and I employ it as a tool which allows me to define and describe space. When I first began making work that emphasized the space between two and three dimensions (i.e. the Oracles 1999/2009, Wonderland 2004, etc) it looked like a kind of DIY extrusion of the grid. 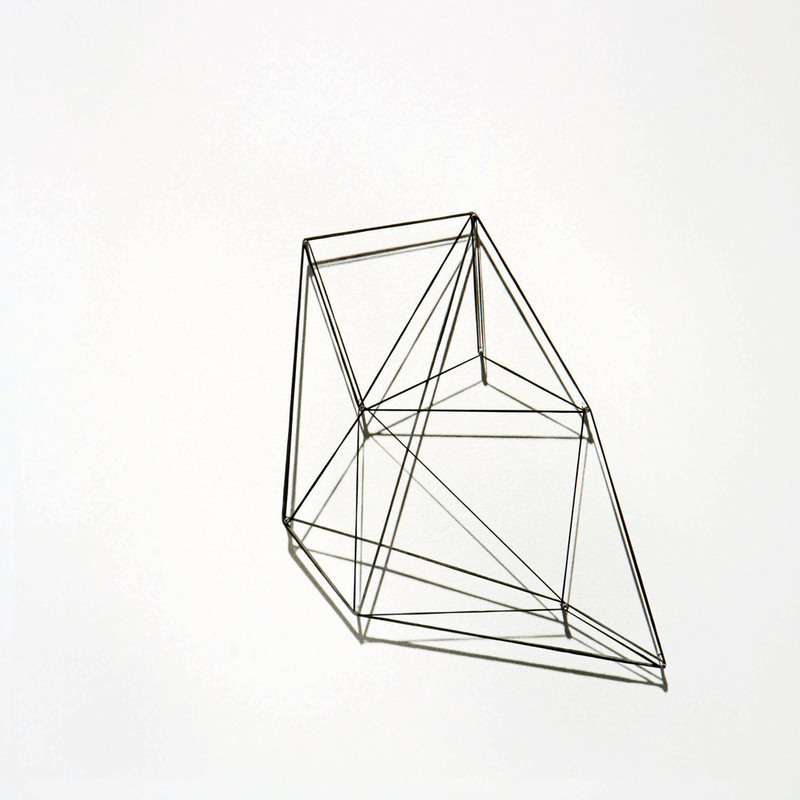 I often begin with a single line or shape that mutates and proliferates to become an expanded wire-frame-like structure. The geometries I employ, though they may suggest mathematical systems, are usually intuitive and wonky. In the case of Blue Sun, I saw it in a flash. I had the vision of a large blue crystalline form repeating but transforming across the space (echoing the sun as it appeared in the time-lapse). It was one of those rare and lucky moments when the ideas that had been gestating in my mind merged instantly with the space in the Pavilion. My challenge was figuring out how the piece would have the same strength of that original vision, with the emotional punch of something between joy and oppression. 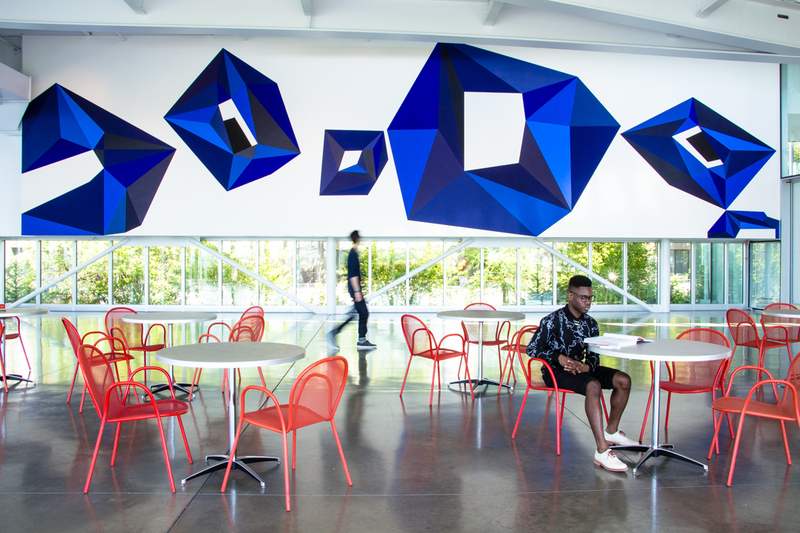 The space requires the work to have a powerful visual impact, from afar as well as up-close. To accomplish this I drew from my deep well of mind and body memory; drawing and painting line upon line and edge upon edge to create these enigmatic forms as well as the negative space that defines them. You filmed 10 months of footage for Studio X, the piece that inspired Blue Sun. Did you watch all 10 months of the footage? What was it about the blue sun spots that made them jump out from within so much footage? Yes!! I not only WATCHED all 10 months of footage, I (along with my studio assistant Elliot Bosveld) edited over 500,000 still frames that became the 24-hour time-lapse video, Studio X—a video projection which documents the radical transformation of this city, shot from the fourth-story windows of my studio in Seattle’s South Lake Union neighborhood. In the process of filming and editing Studio X, certain recurring patterns unfolded. What struck me most as I sorted through day after day (293 in all) of altered city and sky, was not only the massive construction site my neighborhood had become, but the subtler recurring moments that stood out among the drama; the trees that would appear to wiggle in the distance, and the sun (when it showed up) stuttering across the sky in 30 second intervals. I was captivated by how my low-fi camera transformed the glowing celestial orb into a blue blob, with a halo of fractured pixels and varying values. 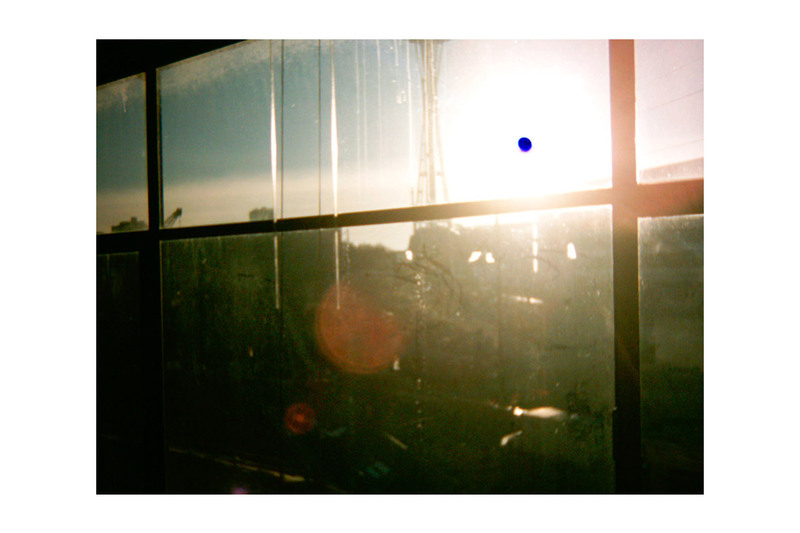 It was also this aspect of the sun’s repeated and consistent trajectory that opened-up the work beyond the frame-by-frame depiction of gentrification and development on a human scale toward a broader poetic geological timeline. I knew I wanted to isolate this feature and explore an abstract version of this phenomenon. This commission for the Olympic Sculpture Park Pavilion wall provided me with the perfect opportunity to do so. Images: Installation view of Blue Sun, 2016, Victoria Haven, American, b. 1964, acrylic, 57 x 14 ft., Seattle Art Museum, 2016 Commission, photo: Natali Wiseman. Installation view of Blue Sun (detail). Oracle 4, 2009, Victoria Haven, selenium toned silver gelatin print 19″ x 15.75” Edition of 6. Wonderland, 2004, Victoria Haven, shelf paper, adhesive, Yupo, pins. View of title lettering from Blue Sun. Still from Studio X, 2015, Victoria Haven, dual screen video projection, dimensions variable.